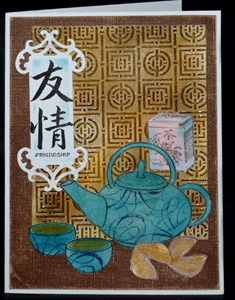 The teapot card is on the cover and also uses a gg design stamp set "Teapot", used the outline stamps - Love this set. (Charlotte's blog) I did alter the cups by cutting off the handles to make them look more Asian, and I used the Quietfire "Flourish" stamp to decorate the teapot etc. - I think they were a match made in heaven.. 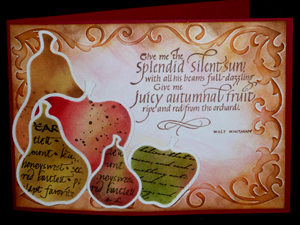 The 2nd card uses the Spellbinders dies "Apples" "Pears" - love these 2 die sets. Also one of my latest embossing folders - our it was BIG GRIN. I love what you did with the flourishes on the teapot. This and the layout take your card beyond the norm. Very nice work! Well, the cards are out of this world, as always! Works of art!! I have to ask if you used MS punches for your punched BG? Congratulations on your getting published in VSN! I love the two cards, I don't know which is my favorite. I'm continuing with my efforts, am pleased with my progress. I really appreciate your comments on gggazette. The teapot with flourishes is brilliant!